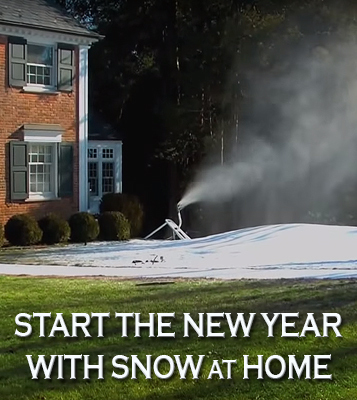 Make real snow at home with a home snowmaking machine ! Make it snow! Whether you are looking for falling snow effects or REAL snow, visit our products page. Not cold enough where you are to make snow? Check out the Blizzard Wizard line of artificial snowmakers. Can I Make REAL Snow? Could you have made snow last year? Last week? Tonight? Enter your zip code above to find out. Want to Make Real Snow? The SNOWatHOME™ web site is for anyone who is interested in home snow making for any reason. SNOWatHOME has been in business nearly 20 years! We have done extensive research on making man made snow and designing home snow machines that can produce a blizzard of snow just like the snow makers at ski resorts. It is tons of fun to have the ability to make snow in your own yard for skiing, sledding, snowboarding, or any snow related activity. SNOWatHOME™ has used its research to develop, manufacture, and sell its line of Snowmaking equipment for homes and small businesses. Our snow maker line ranges from snow making nozzles to build your own snowmakers all the way up to small scale commercial snowmakers. In addition we have a full line of pressure washers and high volume snow making pumps. If you found this site in search of free instructions on how to build your own real snow making machine, or you are looking to purchase a snow maker to make real man made snow SNOWatHOME™ can help. You live in a area that occasionally has freezing temperatures but rarely has natural snowfall. Create your own snowboard and ski terrain park! Guarantee a White Christmas, home decorating like never before! Businesses, attract holiday customers and free media attention! Backyard sliding and skiing hill, be the envy of the neighborhood! School science project, win best of show! Or just for fun, the list goes on. Not cold enough to make snow? Try our Blizzard Wizard Special Effects snowmakers for year round indoor and outdoor fun!